Spoil your loved ones on this special day! 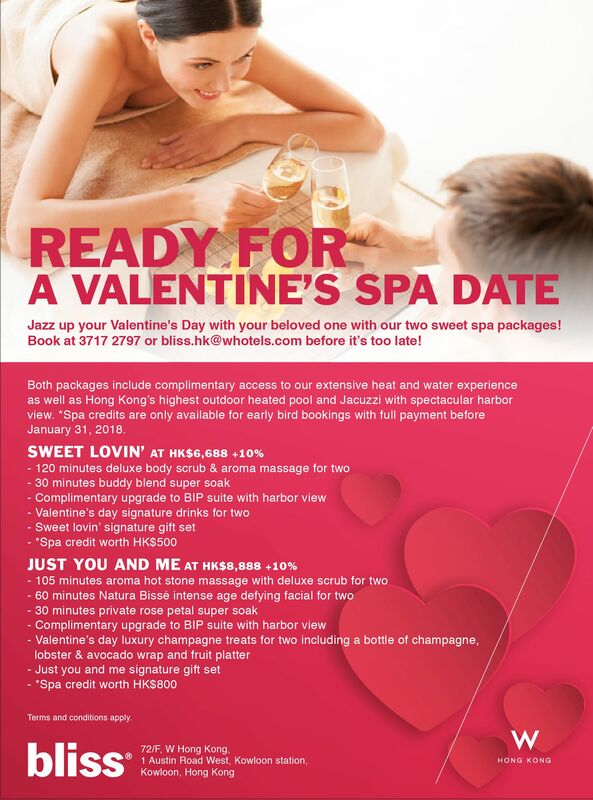 With Valentine’s Day right around the corner, treat your lucky ones (and the little folks at home) to something thoughtful. Whether your sweetheart is an avid gym rat, someone who loves to curl up with a good book, or someone who is always on top of the latest fashion trends, we’ve got the perfect gift idea for every loved one – big and little kids alike – in your life. Happy shopping! For a romantic getaway from your usual daily grind, treat yourself and your one and only to a holistic spa retreat at W Hong Kong (starting from $6,688). Free from the distraction of a constantly buzzing phone, the private pampering session is ideal for spending some quality time with your partner. From an invigorating hot stone massage to a youth-revitalizing facial and rose-infused super soak, all the while enjoying champagne and some light refreshments, the therapeutic experience will soothe your senses and promote deep relaxation for both body and mind. For the perfect finale to this magical date, head over to the 76th floor and take a dip in the heated rooftop pool and Jacuzzi overlooking an enchanting harbour view! Online reservations are available here. Check out the full treatment menu here. Your superwoman (who manages to balance work and parenting) deserves a gift that does multi-tasking as good as her! Doubling as daytime outfit coordinates, Grana’s modern pyjama pieces are equally stylish and functional. Wear the sleepwear – full set includes matching silk shirt ($536), pants ($691) and eye mask ($94) – to bed at night. In the morning, roll up the sleeves and tuck the shirt beneath a pair of high-waist jeans for an effortlessly chic look. Sweep your special someone off her feet onto cloud nine with Spoilt’s luxury fly and tea package ($5,200 for two people)! The 15-minute helicopter tour offers captivating sights of Hong Kong’s most iconic landmarks, including the International Financial Centre (IFC) and the Peak, and you’ll score major brownie points for going above (literally) and beyond to impress your other half. You have the option to enjoy a classy afternoon tea at the Peninsula Hotel before or after the ride. Serving traditional English scones, finger sandwiches, and dainty patisseries, these sumptuous treats are perfect to top off an already action-packed afternoon! Online reservations are available here. February 2018 blackout dates include 9, 10, and 14. Small but mighty – Amazon’s Echo Dot (US$49.99) is a hands-free, voice-activated speaker that connects to your phone and smart home system to carry out simple household tasks. From turning the lights off to commanding Netflix, this tiny personal assistant device brings home automation to the next level. What’s a Valentine’s Day gift guide without the mention of chocolates? We’ve got our eyes set on La Maison du Chocolat’s newest “In the Heart of Parisian Gardens” collection ($280 and $470). Adorned with paintings of a dreamy French landscape, these special edition gift boxes are packed with sweet surprises. Discover four special holiday flavours – Orangeraie, Fruity Jasmine, Lemon Tilleul Honey, and Zested Ginger – inspired by beautiful Parisian blooms and evergreens. La Maison du Chocolat is also offering free delivery when you spend more than $500 online, before 12th February. Collection available for purchase online and in all boutique locations. No matter what his taste in fashion is like, a well-fitted suit always comes in handy when dressing for formal occasions such as business meetings, weddings, or dinner parties. Give your S.O. a custom tailoring experience at Empire Tailors and let the seasoned couturiers do the rest. Take home a timeless piece that will last in his wardrobe for years to come – in other words, it’s a fashion investment that totally justifies the splurge! Make a reservation online here. Walk-ins are welcome! The globe-trotting, jet-setting man in your life will be thrilled to get his hands on this slick scratch-off world map ($450). To create a customised record of travel adventures, rub off the top coating of the map, unveiling the colour beneath the copper foil and marking the countries he has been to. The beautifully crafted poster also makes a statement home décor piece and adds a touch of personality to any space. Whether your special someone is an outdoor lover or fashion enthusiast, you simply can’t go wrong with these iconic shades. Inspired by the 50s, Ray-Ban’s Clubmaster Classic ($1,900) instantly adds a retro flair to any outfit. With a modest fit and neutral colours, your man will want to rock these versatile sunnies everywhere he goes! They say there is nothing a good cocktail can’t fix! Bring Friday happy hours back to your kitchen with Difford’s Guide to Cocktails #12 ($346.70). Packed with recipes (more than 3,000 of them) that will please even the pickiest drinkers, this guide will get your cocktail aficionado at home excited to start mixing and shaking right away. From the classic Old Fashioned to Vodka Martini, this authoritative handbook offers stunning illustrations and easy-to-follow instructions for bartenders and hobbyists of all levels. Available online via Book Depository. It doesn’t matter if you’ve got a significant other who hits the gym most (if not all) days of the week, or one who is looking to kick-start his fitness journey, surprise him with a Fitbit Flex 2 ($868), motivating him to follow through his workout goals. This sleek, light-weight gadget can track its wearer’s steps walked, calories burnt, sleep patterns, and more. We’re loving this gift; it cultivates gratitude, encourages positive thinking, and gets the impatient little ones into the habit of self-reflection. The Five Minute Journal for Kids (US$22.95) does all that in only five minutes each day! With beautifully illustrated pages and an easy-to-use format, the kid-friendly journal caters to even those with short attention spans and makes a fun parent-child bonding activity. For more mature kids, opt for the original Five-Minute Journal (US$22.95) that features a more polished, minimalistic design. Tired of listening to the same damsel-in-distress plot being told over and over again? Robert Munsch’s internationally acclaimed The Paper Bag Princess ($47.92) introduces a fresh take on conventional hero fictions. In this reversed gender role story, early readers will follow the resourceful Princess Elizabeth on an adventure to rescue Prince Ronald from the evil dragon. A must-read for budding intellectuals – the inspiring picture book breaks down traditional gender stereotypes and celebrates the accomplishments of a strong-willed female leader! This hilarious card game is what you need to pull the little ones away from their screens. Inspired by Cards Against Humanity, Not Parent Approved (US$24.99) is an award-winning party game offering quality device-free time that your kids will actually look forward to! Bring the deck to sleepovers, over-night camps, and family gatherings to share the fun as you go. Available online via Amazon and Fishpond.com. Let your adventure-hungry, thrill-seeking child blow off some steam with a ride on the penny board ($399). They will quit complaining about being bored once they set foot on this beauty! Capture picture-perfect moments with the Polaroid POP Instant Camera ($2026)! In today’s world of bits and bytes where smartphone photography rules dominant, many young digital natives still get a kick out of the old-school instant cameras. With the newest Polaroid model, which fuses analogue and digital features, users can take instant photos as they normally would, and also print photos from their phones. For a fun Valentine’s Day date with the whole fam jam, head over to the newly opened SuperPark Hong Kong (tickets starting from $180) in Tai Kok Tsui – a one stop shop for adrenaline-rush activities appropriate for all ages. Featuring three themed areas and more than 20 indoor sports activities, the 45,000-square-foot playground is worth taking the trip across the waters. Experience life in the fast lane on the Pedal Car Track, channel your inner Spider-Man at the Augmented Climbing Wall, and bust some money moves on the Hot Stepper! For a less active but equally exciting option, bring your family to The Great Circus of Europe (tickets starting from $150) at The AIA Great European Carnival. With an impressive cast of more than 25 performers from around the world, the show presents hair-raising acts and riveting feats – including The Gerlings High Wire, Motorcycles in the Globe, and The Space Wheel – that will keep you on the edge of your seat the entire time! Prepping for a romantic Valentine’s Day dinner at home can be a chore, so why not enlist the help of a junior master chef? But first, you have to make sure their cooking skills are up to par. Enrol your kids (and yourself!) in a family cooking class ($480 per child and $100 per accompanying adult) with the seasoned instructors at COOKTOWN. Learn how to make spaghetti Bolognese and a chocolate molten cake that is sure to warm everyone’s heart (and stomach!). Bon appetite! Available for booking online here. Discover a creative way of expressing yourself and communicating with your loved ones using the language of art. Choco L’ART provides a supportive space for you and your kids to unleash your imagination and explore your artistic sensibilities. Sign up for a family art jamming session ($300 for one adult and one child, and $220 per additional adult) for free-flowing acrylic paints and brushes. For an out-of-this-world experience on Valentine’s Day, embark on a virtual reality mission with your family to the Deadwood Mansion. Take down the mad scientist whilst fighting zombies along the way! Offering the world’s first hyper-reality escape room experience (starting from $160 per person), GloStation is the ultimate destination for you and your daredevil teens to enhance teamwork and tackle a challenge together. Why not give a gift to someone who really needs it this year? Habitat For Humanity is having a cookie sale to help raise money for those less fortunate. This organisation builds homes for the less fortunate and for just $195 you will be helping to provide shelter to a family. Its motto is “creating a world where everyone has a decent place to live,” and we love that idea! Whilst you’re in the giving mood, it may be worth donating your time over the Chinese New Year holidays. Check out the charities, nonprofits and organisations offering volunteer opportunities in Hong Kong. Image #1 courtesy of The Peninsula Hong Kong, Image #2 courtesy of Ruthson Zimmerman via Unsplash. Image #3 courtesy of The Five Minute Journal via Facebook. Image #4 courtesy of SuperPark Hong Kong via Facebook. Born and raised in metropolitan Hong Kong, Kei Wa is fueled by the city’s vibrant energy and people. A city girl and nature lover all at once, she is always ready to hop on her next adventure. When she is not busy typing away on the computer, she is likely to be found checking off her ever-expanding travel bucket list or tucked away in a quiet neighbourhood café.